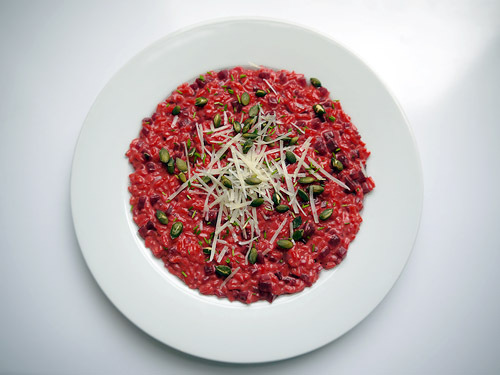 I have had a ‘must try’ recipe for something very similar to this since last year – perhaps I ought to give it a go as it’s the second time I have seen a Beetroot Risotto recipe posted this week! PS Thanks for adding me as a link. Let me know how your recipe goes. If there are any tips or tweaks, I would love to know. My basic risotto has been a few years in the making, getting to just how prep and cook everything. 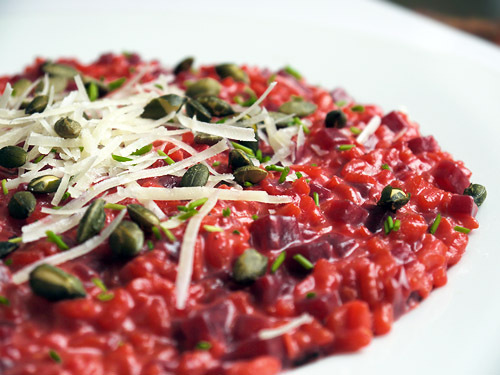 The popularity of beetroot risotto has, in part, to be due to the colour. When it is so grey outside, it’s so nice to have a dish that is so vibrant. This is the best valentines dish I have seen, perfect I will have to make it since I am bait risotto and beetroot fan. Might be tempted to add some goats cheese but that is a faze I am in at the mo. Thanks for the complement! Goat’s cheese would probably be nice with this – possibly the creamier stuff crumbled on top just before serving. I love goat’s cheese too – my favourite way to eat it is on toasted bread, lightly grilled, and just a touch of honey. Mmmmm! And so this is why I love reading your blog. There is always something unique and interesting going on. Thanks for sharing. Thanks so much! I’m trying to keep things interesting, so good to know that you like my posts! Yes, it’s easy to get caught in the hype! But I think it’s quite fun to make a bit of a gesture – and with beetroot in season right now, I think you can easily claim this is a wry nod to Valentine’s Day without going overboad. Lucky you with friends that bring macarons! In London, that generally involves a trip down to the West End, but saying that, you can get some amazing flavours from Yauatcha, so worth the effort. Achille – un grand merci pour ta recette aussi!